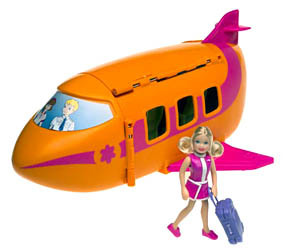 Polly and her puppy will travel in style in their luxury airplane. There is an upper and lower deck with places to sit and sleep and plenty of space to store items. Polly can enjoy a snack from the food cart while enjoying a movie. Play pieces stored inside can transform into a tropical island vacation destination. Includes Polly, her puppy, lots of Polly-Stretch fashions plus vacation accessories.